When business owners ask me for fresh content marketing ideas, the first solution I recommend is the case study. It’s so robust; no other format offers as many diverse benefits to an Internet marketing strategy than the case study. And in a recent CMI/MarketingProfs study, B2B content marketers reported a 70% effectiveness rate for case studies in their campaigns. So why doesn’t your business website boast a deep list of case studies? It could be because you’re apprehensive to ask a customer for an interview that will add credibility to a story about an experience with your product or service. “For your clients, the value is not so apparent,” says MarketingProfs.com contributor Paul McKeon, “you are asking your clients for a big favor: a public endorsement.” This holds many marketers back, wary of resistance and rejection. Today, we ask you to consider case studies as a win-win for the client and your company. Read on for 5 powerful benefits of adding case studies to your content marketing arsenal, and check back next week for a refreshing new approach to case studies that will have customers eager to participate and share! Case studies give consumers the confidence to trust a product or service by providing relatable human evidence of its value. Unlike a testimonial, a case study puts the value in action, taking users on a specific journey through the usage of a specific product or service. It’s word-of-mouth validation that marketers covet, and consumers rely on to make decisions. A rich customer narrative, loaded with direct quotes and characterizing details, helps prospects relate to your product or service, and impresses them to imagine it benefiting their lives. A case study provides prime material for multimedia, which expands its reach to a wider audience of visual and auditory learners, and boosts SEO across platforms. You can film a case study, add pictures or infographics to the written version, and publish a podcast of the script. Customer stories are invaluable pieces of marketing collateral; case studies let you maximize their potential. Additionally, the information from a case study can be used in multiple touchpoints and formats across marketing channels. Case studies often necessitate keywords that help websites rank higher on Google, because at the core of any case study is a specific product or service a customer used to solve a problem. Fresh content with keywords pertaining to your products or services often improves the website’s visibility on searches where those words are used. 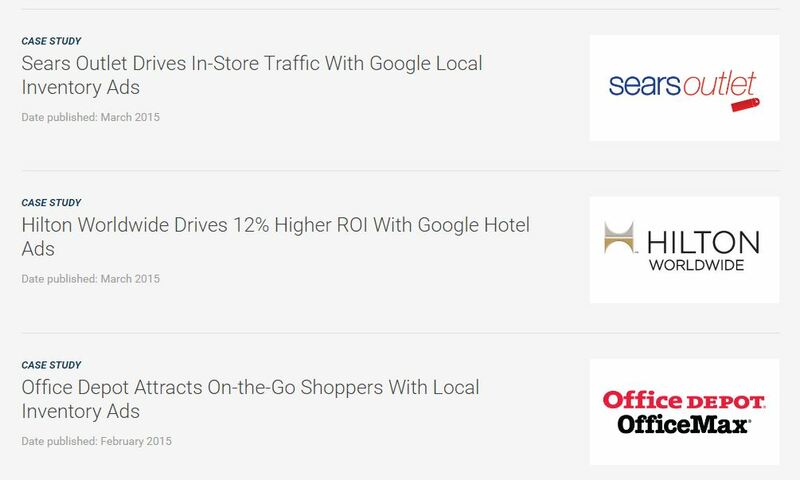 The narrative structure of a case study makes it easy to incorporate keywords that boost Google rankings for specific searches. You can only conjure up so many “How-To” blog posts before your imagination goes sour. Case studies cure content marketing creativity blues by spotlighting unique customer experiences. With your customers in control of the narrative, no two case studies will ever be the same. Your products or services are promoted in compelling, original stories unlike any piece of content created by your competitors. Destroy any apprehension you might have about approaching customers to share their experiences; case studies can be used as part of a mutually beneficial customer appreciation program that builds stronger business relationships (and potential brand advocates!). 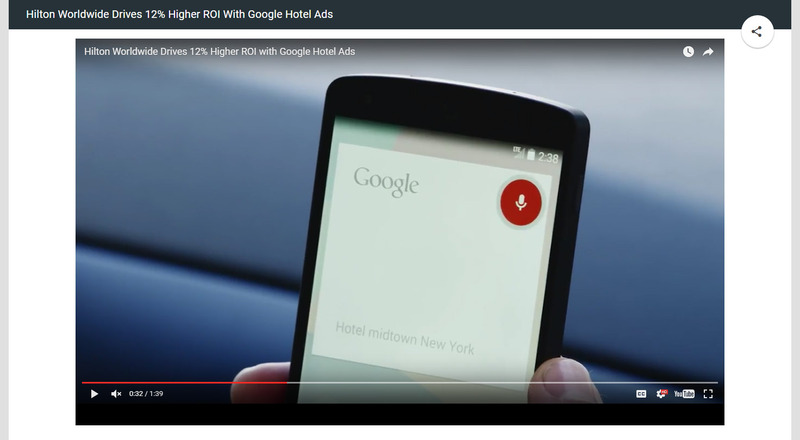 Google’s Hilton Hotels case study is a great example of customer advocacy in a case study. With this approach, you don’t ask for a favor from your customer- you offer a benefit. Your customers will be excited about you including them in your case studies for content marketing with a brief explanation of what you’re doing. 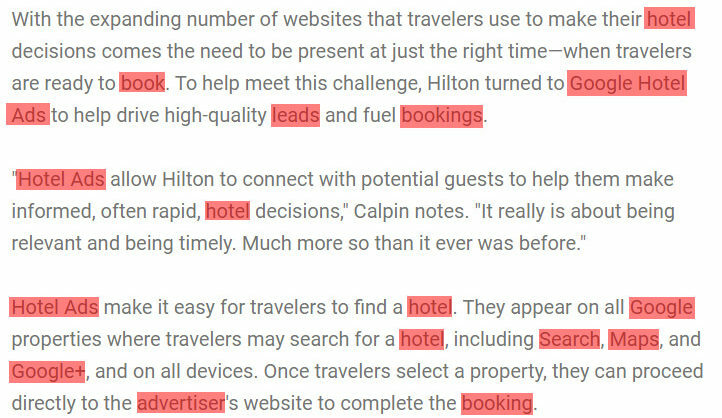 In the example we’ve looked at throughout this article Google gets a case study for their hotel search ads product; at the same time, Hilton gets an excellent piece of PR from Google. Win-win.